L’Oréal is using Swaven’s Point Of Purchase solution since 2014 for several brands and touchpoints; on its brands’ websites for continuous use and on media campaigns during peak sales seasons. 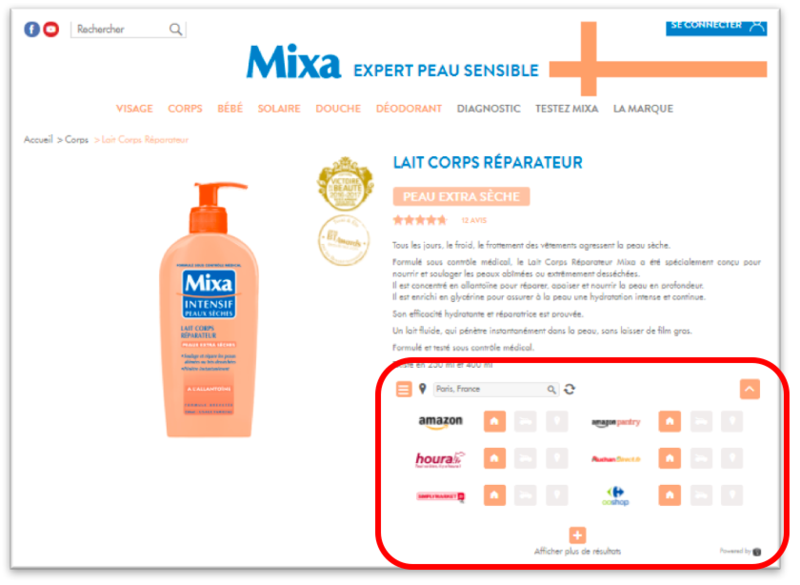 The collaboration began with L’Oréal Mixa when the brand chose to equip the product pages of its website with buy buttons powered by Swaven. The POP (Point Of Purchase) solution allows the visitors to discover in one click which resellers online or in physical stores nearby are selling the product and to get to the retailer of their choice with another click to finalise purchase. Encouraged by the results, L’Oréal implemented Swaven’s purchase option on fifteen other brand sites in France including Garnier, Gemey Maybelline, Narta, Ushuaïa, Cadum, Mennen, Vivelle Dop, Eau Jeune, Dessange, Essie etc. The following year, the collaboration was extended to media advertising campaigns. L’Oréal deployed Swaven’s POP in display and video campaigns to promote a mascara during the summer period and later on to boost the Christmas sales of its fragrance brands such as Diesel, Cacharel and Giorgio Armani. Swaven’s unique in-banner and in-video technology allows a seamleass viewing experience. The users visualise the retailers directly in the ads instead of having to move to another environment. The brand keeps control of the purchase path and avoids losing the audiences interacting with them. L’Oréal has realised the importance of offering the purchase option to consumers on all touchpoints. Therefore, the LaSCAD entity continued in 2016 to deploy the POP In Video solution for Mixa and Narta and started to test the mobile interstitials for its Puma brand. 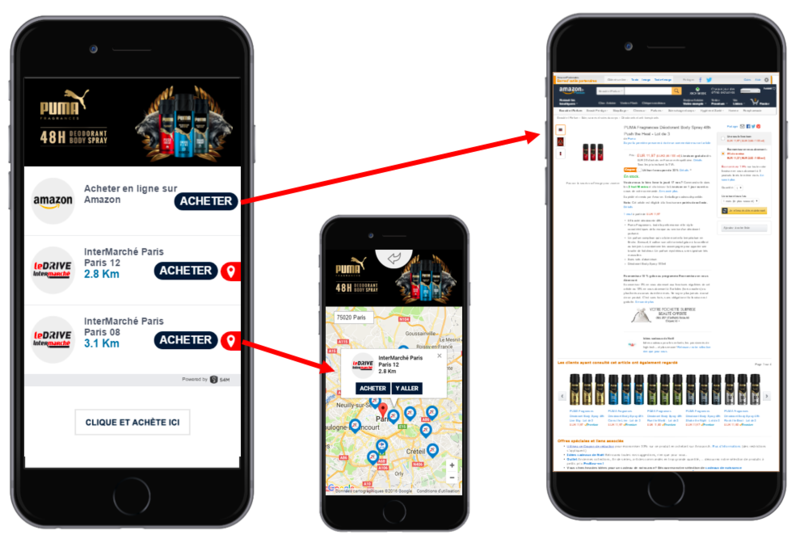 The principle remains the same, the user is guided to the shopping pages of the distributors directly from the mobile ads to accelerate the purchase path. In 2017, L’Oréal continues to develop its services to consumers with Swaven and has now replaced some of its brand sites with POP Landing Pages. First brands to test this approach were Eau Jeune and Vivelle Dop. The Landing Page solution allows L’Oréal to offer a user-friendly branded page visit with convenient purchase options to visitors without having to spend time and efforts managing and maintaining more complicated websites. The landing page link can also easily be included in any communication of the brand to guide audiences directly from social media, chat, emails etc. towards purchase options. Video media campaigns powered by POP were also released during the summer 2017. Cadum, Vivelle Dop and Dessange brands took advantage of Swaven’s in-video technology to once again better satisfy consumer needs. This autumn, L’Oréal is extending the collaboration with Swaven to yet another brand. Lancôme has decided to deploy POP for its website in the Middle East region. Swaven’s POP solution allows brands to convey brand messages whilst at the same time offer convenient services to consumers and drive sales. All this from the same touch points providing product and retailer information and purchase options. In addition to generating qualified traffic to their resellers, the solution helps brands to better understand their audiences as they can monitor and analyse the purchase path and preferences channel by channel based on the collected data. Contact us to learn more about how you too can generate leads and drive sales directly from your brand contents, worldwide.